The Mikado changes its name to Mirado with the outbreak of the Second World War. I don’t know enough to date the pencils precisely, but the top pencil with the large Art Deco eagle logo originally came in this display, and from the look of it I would guess it to originate from around the 50’s or 60’s. This particular version of the Mirado is my favorite; it looks and writes the best. The lead is still soft but the graphite seems finer. The successive (Eagle and Berol) Mirados seem to write slightly lighter and harder, but they are still fine, clean-writing everyday pencils. Until one hits the Papermate Mirado Classic, which is soot-black and crumbly – but at least isn’t scratchy. All the pencils, even the Papermate (though severely abbreviated), share the red-banded gold ferrule, and when I rummage around my burgeoning pencil case the ferrule actually helps. 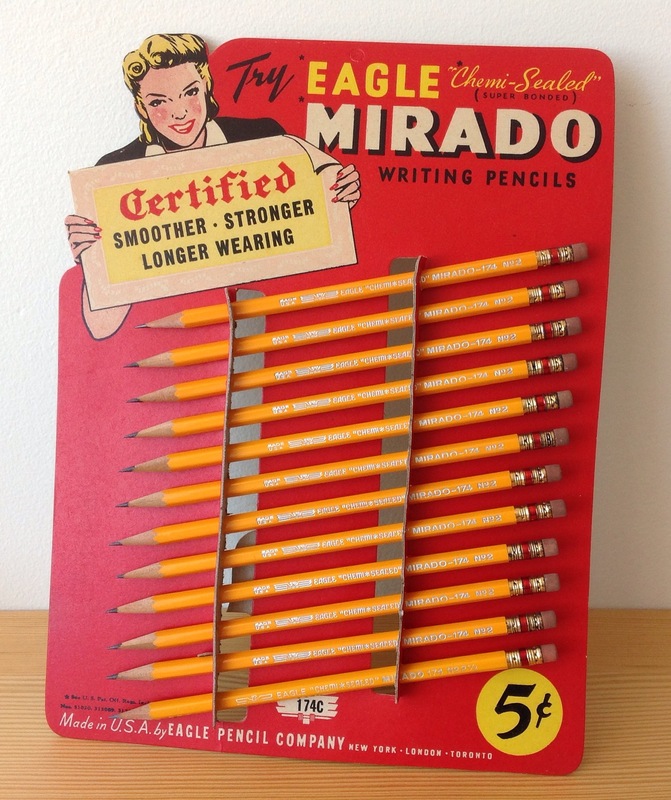 A special note about the Canadian Eagle Mirado pencils: the Eagle Pencil Company set up a Canadian subsidiary in Toronto in 1931, and a factory in Drummondville, Québec, to supply the Canadian market. Despite the glowing reports on how it was all Canadian-run, the Californian cedar and the graphite for the pencils seem to have been imported. They produced Mirados, fountain pens, erasers, mechanical pencils, and Prismacolor and Canadiana colored pencils, among others. 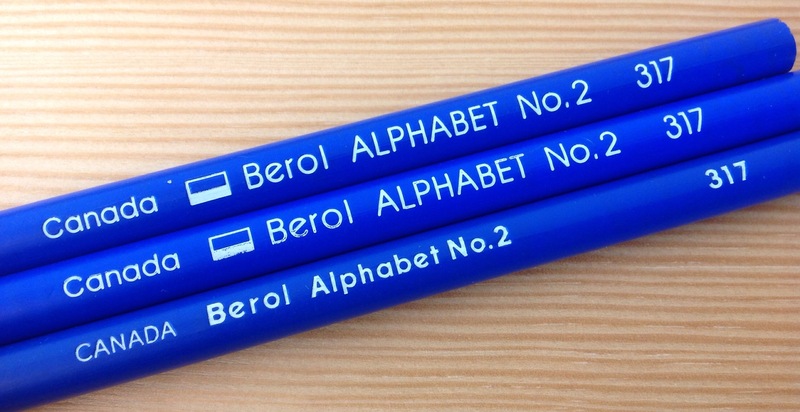 Not all countries produce their own pencils, I think (or do they? ), and I was very glad to have found traces of one such facility near where I live now. It continued despite a succession of acquisitions, but sadly ceased production in 1994. However, they are still producing pencils somewhere in Canada, as evidenced by these jumbo pencils – the stationery store manager tells me they are made by Dixon.